Verot STEM Team takes 1st, 2nd, and 3rd Place in Stem Tour event. Members of the Bishop Verot STEM Team captured first, second, and third place in the kick-off event for the 2016-17 STEM tour. In the first of seven events to be held this year, the Board Game Bonanza event re-created life sized board game challenges. 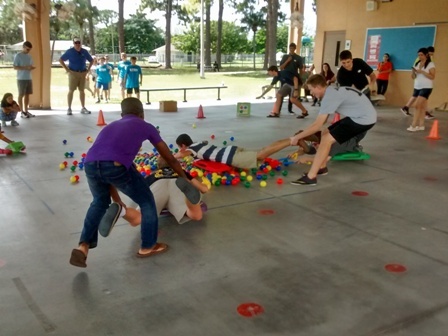 Students competed in modified versions of Jenga, Connect Four, Tic-Tac-Toe, Yahtzee, and Hungry, Hungry Hippos.